It is one of the real joys of traveling, when one finds ones self in a string of friends, families, contacts and compadres! This is guanxi. It makes all the difference. I had a pretty stressful departure from Beijing, where I timed my airport arrival to perfection, to find that I had got the wrong terminal…der! This meant a high-speed taxi ride (the bus wasn’t going for another 15 minutes!) to the right terminal, miles away. After a line-jumping, flustered check-in and a full speed run through security, I made it to the plane, just in time. The flight across China was very relaxing and interesting, observing the scale of the nation and its development over thousands of miles from thousands of feet. As planned Bing Bing and his wealthy businessman uncle were there to meet me and drive me to Xining. At first sight, Xining is a scruffy looking, dusty, city, stretched along a valley floor between ravined mountains. The typical Chinese air quality problems are here too, even in a small city of 1 million, but not as bad as Beijing, you can at least see blue sky beyond the valley. The city is the provincial, multi-cultural capital, where Muslims, Buddhists and Han Chinese coexist…in relative peace, I am told. Here there is the biggest Mosque in China, which I didn’t get to see close-up sadly, but I did see from afar at night, with it’s amazing illuminated minarets. We headed to Bing Bing’s flat, where he lives with his mother and father. He is a very warmhearted 22 year old film student, who is on summer break from university in Beijing. He speaks good enough English and good French, so we speak a mix. His apartment is up six flights of cold drab old steps. It is small, but cosy. Here we hatch a plan for the week. He is extremely helpful, pulling out an old school text book with a map of the state that shows a few roads. I don’t think I fully got the scale until we actually hit the road…it is nearly twice the size of France! There are many options and Bing Bing is happy to help me on any one of them. Either I go solo and bus it around, or I rent a car and driver and Bing Bing comes with me, or – he suggests – his Dad (a school teacher) who is free for the next few days and would be happy to call one of his friends who is a driver so we can all four go together, sharing the costs. No problem let’s do it. So whilst his Dad musters his Muslim driver friend, Bing Bing and I go off to a street market to find a coat for me. It is already cool in Xining, compared to Beijing, but as we get up to the plateau it will be extremely cold, especially at night. I luck out and buy a heavy duty wool-packed Chinese railway workers coat, that I am sure will last a life time. On returning home we waste no time and jump into the car and head to the nearest, and largest Tibetan monastery town in the province. The town of Ta’er is the home of Kumbum monastery, one of the 5 most important monasteries of the ‘yellow hat’ sect in Tibetan Buddhism. It is the biggest Tibetan monastery outside of Tibet, that was started in the 1560’s. The current Dali Lama was born not far from here up in the mountains. He is still widely praised by the faithful here, even though the government commend the Lamas of Ta’er as the most compliant in Tibet to their restrictive control. It is an interesting and bustling town and monastery where coach-loads of Tibetan devotees and Chinese tourists fill the streets buying tat and touring the temples. The monastery buildings are very beautiful, in a dusty unpretentious way, set in a drab valley, surrounded by prayer-flag draped hills. 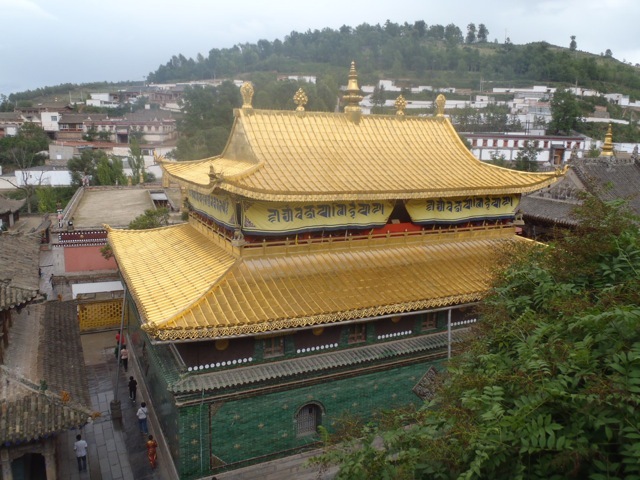 The famed gold roof temples (actually yellow copper), shine bright, even under the storm-clouded sky. Here we click into another guanxi. Bing Bing’s mother, it transpires, works in the provincial government and deals with officials in all the districts’ towns and cities. So in order to get the best treatment on visiting the monastery we call Mum’s friend, the local government man, who comes out of his office in the monastery forecourt, waives the entrance fee for us and provides us with a lovely lady guide. Slick, hey! It is who you know around here that is for sure! Our private tour lasts an hour or so, running from temple to temple, as a huge thunderstorm blackens the sky and bursts brimstone on us. The monastery is fully alive, hand-padded pilgrims prostrate themselves through the streets and at the doorways of the highly painted ancient wooden structures. Monks bustle around doing what they do, accepting offerings, clanging gongs and blowing long horns, in and out of the public and private sections and courtyards. Inside the temples are glumly light by dim bulbs and Ghi candles. The air is rich with incense and Ghi. Aside form the huge brass Buddhas, whose heads look down, benevolently on you from the lofty heights, Kumbum is famous for its tradition of making Ghi Buddhas. These are intricately carved butter sculptures that are remade every year, during the freezing winter months, by the numbed hands of specialist monks. They are kept cool through the summer behind chilled glass boxes. Though one of those amazing and bizarre Tibetan traditions, I can’t say the butter Buddhas look all that great by the end of the summer, some are decidedly droopy and they smell well rancid! It was an interesting place to start my short exploration of the region and get a feel for monastery life in Tibet, even amongst the swarms of visitors. Bing Bing mentioned that there was a street where they made a lot of the Buddhas in metal. This immediately caught my ear, so we pulled out of the monastery complex and headed down the road to an area where the familiar sound of banging metal greeted us. 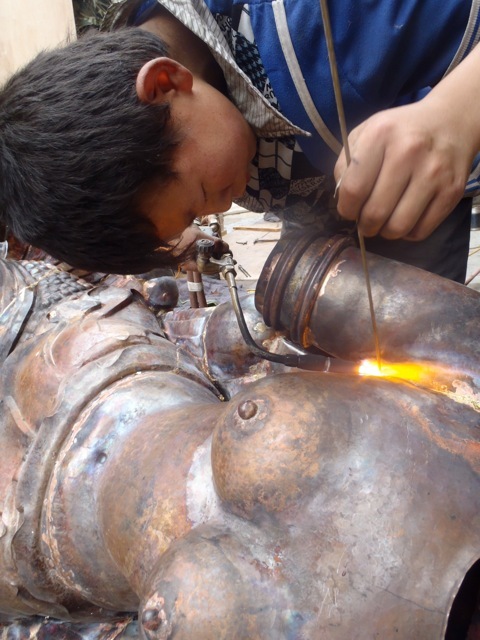 I was at home right away, very happy to find a gently sloping street, running down to a market area, lined with bustling workshops full of people of all ages banging, bending, grinding, tapping and soldering a huge variety of traditional Tibetan temple sculpture and general temple paraphernalia. They were using ancient repousé techniques, beating the copper onto a pitch bed, or in some cases rubber pads on the floor. Every workshop was busy, inside and out on the street. Finished works lined the pavement waiting to be delivered or sold to the prowling Lamas who were looking for new work to fit out their temples. Medieval apprentice practices were defiantly in action here, with children of 12-ish involved in the basics of the production process, though most of the skilled work was done by young 15 to 30 year olds, both men and women. The quality of the work was extremely high, and everything produced here is strictly traditional Tibetan, nothing being banged out for the tourist trade. I learned that this street is one of only two streets like it in the whole of great China, the other street being in Lhasa, Tibet. The interesting thing is that the work is being carried out by Han Chinese, who had been taught many generations ago by the Tibetans. The only other comparable places I have been to are Bhaktapur in Nepal and Marrakech in Morrocco. 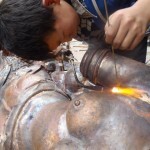 Here, whole cities are devoted to the arts of metalwork, pottery and woodcarving. Ta’er is not the scale of Bhaktapur or Marrakech, but still a wonderful find and a place I schemed to come back to before leaving Qinghai. We were on the move again, linking back up with Bing Bing’s Dad, to head out of town and higher into the mountains for Tong Ren. We drove along the Yellow River for a while, before heading up an impressive gorge, with a rushing muddy river flowing through besides the precipitous road. 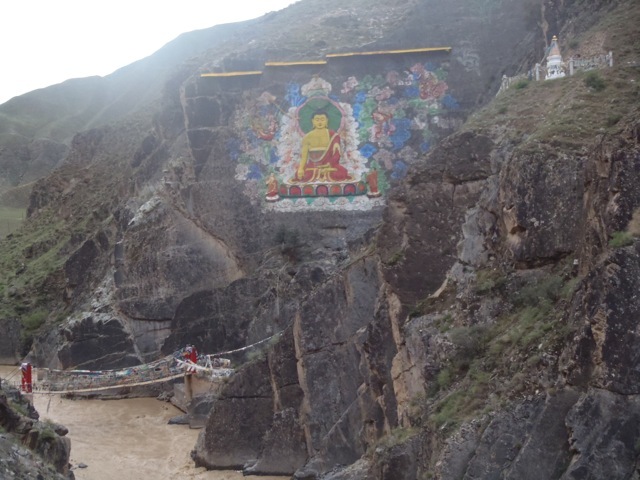 We stopped the other side of the river from a huge painted Buddha, that had been carved into the cliff face across the ravine. The devotion of the Tibetans and the cliff-climbing artisans is inspiring in its grand scale. You start to feel the chill up here as we get up to around 3000 meters. Soon enough we came through the gorge and the landscape opened up into a wide valley framed with rolling green hills, on the distant peaks of which were fluttering poles of prayer flags. The flat lands along the river were glowing in the evening light with fields of golden wheat, many of which were being harvested by back-bent groups of people swiping sickles, tying sheaves and piling up the stooks. Noisy diesel three-wheeled tractors, belching black smoke, slowed traffic on the road, pulling trailers full of grain on top of which sat the harvesters of all ages. It was the busy time of year, so all hands were called to action, to get the wheat harvest in before the long winter. As we neared the town, traffic was cut to one lane because the farmers had commandeered the other lane to dry the grain on the warm tarmac! They were finishing the days drying and starting to rake up the wheat into sacks, completely oblivious to the queue of cars, buses and trucks trying to squeeze past each other on the not-so-wide hard shoulder. Farmers run tings around here. Well not really, I later discovered the CCP is trying hard to dispossess them and their nomadic herding brethren of their ancient rights to this beautiful and seemingly bountiful land. On arriving in Tong Ren, we stopped on the outskirts to call our contact. We then drove on to the new, grand square (as yet unfinished), where we were met by another of Bing Bing’s mother’s friends from the CCP. The firm handshaking Mr Shu, the government economic development officer for this district, guided us into the newish government hotel facing the square. Special arrangements were made that we should only pay half price ($16 a night) or 2 rooms for the price of one, and we were escorted up to the 4th floor with our bags. It was clean and well maintained, though basic with no frills. Dinner was soon upon us and Mr Shu had arranged a special meal in a private dining room section of the hotel, complete with a big round table and a ‘lazy Susan’ in the centre. Being a gracious host, and knowing in advance that I was an artist, Mr Shu had arranged for us to be joined by one of the towns top Tibetan thangka painters, Zhaxi Cairen. 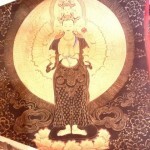 Tong Ren is world renowned for it’s high quality thangka paintings. Outside of Lhasa it is the best place in China for these incredibly detailed and painstakingly produced religious works of art. Our dinner guest we learned…with Bing Bing busy translating for me … works at the Long Wu monastery, where he, his brother Wanma Cairen and few other master painters produce works from their home studios within the grounds of the monastery and teach up to 6 apprentices, each on a full time basis. This week however the apprentices had time off to help with the all-important harvest. There seemed to be a bit of jovial, even patronizing, cajoling between Mr Shu and the artist. Mr Shu was bemoaning his paltry government salary, compared to the rich artists of Tong Ren. 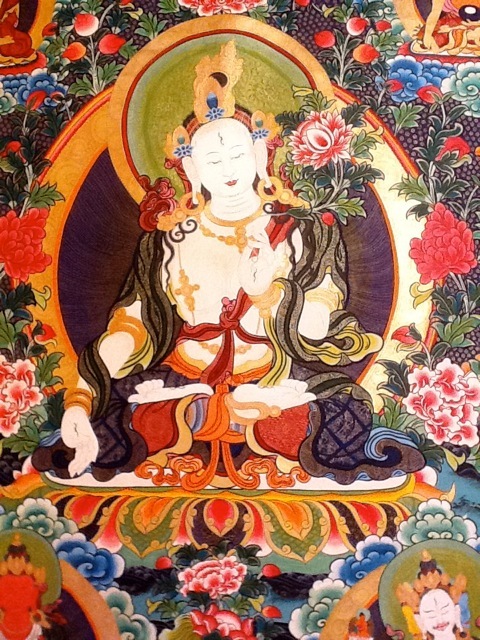 A 1- meter square, full colored, fine detailed, thangka painting might sell for easily 7 or 8000.00 rmb, though it may take 3 months to produce. I sensed that this bothered the government man a bit more than he was letting on. He was also grumbling that lamas are making too much money. I wondered about this myself the following day when I saw a set of them pull up to the monastery in their big brand new black Mercedes! The meal progressed well, the importance of the spinning centre piece coming into play with the Chinese tradition of sharing food. Various new tastes were available…strips of yak stomach or sheep’s vocal cords along with the more routine, wild mushrooms or chunks of lamb leg, chopped up small and cooked on the bone…..try that with chop sticks (!). Bing Bing was hard at it interpreting, as Mr Shu and I bounced through some interesting conversation, in between the steady flow of Chinese wine and Gam bei’s (the Chinese for cheers!). I think he was enjoying my diplomatic questioning about CCP economic policy in the region. I was pretty horrified by some of the answers…. The environmental protection of the region is high on their list of concerns. You can understand why, with serious soil erosion issues highly visible everywhere. The muddy rivers and the gullied hillsides speak for them selves. This is probably the result of years of piecemeal deforestation and over grazing. The proposed solution, though, is extreme and fraught with the potential of Mao era calamities and human suffering. As far I could understand the solution goes something like this:- In order to give the land a rest the government is going to relocate most of the farmers and nomads off the land and install them in new accommodation in and around the towns. This is why low rise Tong Ren now has two huge, east China style, high rise apartment blocks under construction in it’s midst, and many of the other towns in the region have huge brick barrack housing projects going on. This effort continues alongside efforts to reforest and terrace the hills and, in areas not suitable for crops, to plant fast growing strong grass lines horizontally along the hillsides to catch the run off (there is some sense to this). Meanwhile the poor transplanted farmers and nomads are to be integrated into the urban environment and encouraged to engage in business and service sector pursuits. They are literally building lines of shopping streets, with roll-down shutters, all decorated in a kitsch imitation of Tibetan style. These streets, like many of the housing projects, lie empty waiting to be occupied. The shortfall in agricultural production that is anticipated from this relocation will be resolved by the importation of surpluses from other regions. In order to facilitate this in an efficient manner they are also undertaking massive road building projects going in all directions all over the province. What fails to be appreciated, surely intentionally, is the human and spiritual needs of these people and the importance of their ancient relationship with the land. It is bizarre and scary, for those of us that look for the strength and surety of organic growth in development projects. I am not sure how totally in support of the project Mr Shu actually is, he seemed to have a softer heart than I imagine his party bosses must have! We went for a walk around the town after dinner, and he let slip some nostalgic sentiments about how the new square and big government block in the middle was once beautiful green fields, when he was a boy. He was intrigued by my Changchun experience and my fire ball. We bounced the idea of installing one in the new square…he loved the concept and we enjoyed the thought together of every one standing around it to keep warm in the winter! He will be passing it up the hierarchy for approval. We ended our interesting evening with a warm-hearted hug, an unusually close farewell for a first night out with a party official, but I think he genuinely enjoyed our meeting and conversations. I guess it is not every day that he hangs out with a weird artist from the other side of the planet, bold enough to challenge his dubious party lines. 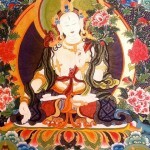 It was arranged that Zhaxi , the artist, should come and collect us in the morning for a breakfast visit to his household and a tour of his and his brothers studios at the Wutun monastery. All fell well into place, and we were soon seated in Zhaxi ‘s neat family home, being served a rich Tibetan breakfast, complete with a soup-like tea, full of Ghi and a rice flour. Boiled yak’s milk and deep fried Johnny-cake kind of things were also served. It was very sweet and welcoming, with his wife and her sister serving us in the polite humble way of their culture. Meanwhile his eldest son of maybe 10, dressed in his monks cloths sits on the sofa playing games on his cell phone. After breakfast Zhiaxi showed us a selection of his unfinished thangkra paintings. They are incredibly detailed paintings of various different incarnations of the Buddha, with illustrations of the stories of his life, mixed into extravagantly ornate patterns and traditional motifs. Some were painted in full colour, others were silvers and golds on black or red grounds. His brother had joined us for breakfast so when we were done we moved over to his brother’s courtyard inside the monastery and saw some of his equally impressive works, including a nearly life-size seated clay Buddha he was finishing off. The clay was not to be fired, so he had mixed raw cotton into the clay to help bind it as the clay shrank. Even so there were a few cracks that he was filing in with slip. I am not sure if the finished piece was to be cast in bronze or was to be painted gold as is and installed in the temple. Both techniques are common around here…though one a lot more costly obviously. 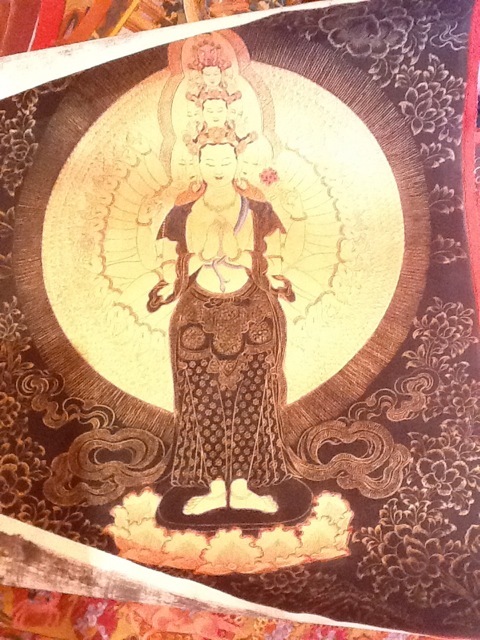 I indulged here and bought one of Wanma’s smaller paintings as a gift for Fede, my busy wife, of Guanyin, the Buddhist goddess of compassion, with her 1,000 arms. It’s not every day you can buy such beautiful painting from the master’s studio. Even the monastery grounds were being fully utilized for drying the harvest, so there was constant comings and goings of noisy mini-tractors loading, and off loading, the sacks of wheat and oil seed, that were being spread out between the stupas to dry. It was a great atmosphere of agricultural, artistic and spiritual life all working as one…. somewhere I could spend more time given half a chance. For the rest of that day we were very kindly hosted by Wanma and taken to the other, bigger, monastery of Tong Ren called Long Wu. There wasn’t quite the harmonious atmosphere of Long Mu here, it being more in the urban environment and some parts of the structure in poor repair. It was heavily damaged by Mao’s boys in Cultural Revolution, but was undergoing steady repairs. It was the home of the biggest Buddha in Qinghai and amazingly lavishly painted temple interiors. It was a real privilege to be being shown around by Wanma, who had done a lot of the interior wall painting and temple thangka. We ended our day by driving out into the valley where we strolled through an ancient rammed-mud village. Here, too, the harvest was engaging everyone in the fields, so we wandered through the near deserted inner streets of the maze-like village. On the walls of many of the houses were cow manure patties drying in the sun. The residents use these as fuel for the cooking fire…nothing is wasted here. At one house we were hailed by a couple of elderly gentlemen from their flat rooftop compound. They kindly invited us into their yard, so we entered the old wooden doorway and up the well-swept mud stairs to see what they were doing. Being too old to partake in the harvest it seemed like they were having a day at home doing a bit of block printing. Hanging under the eves of their open studio were lines of printed “wind horses” on rice paper, being dried. These lovely images get used as burnt offerings at the temples and household shrines. They are bold primitive pictures loaded with all the symbolism necessary to make a good prayer. The younger of the gentlemen then pulled out the blocks of wood that they carve to make the prints. Some of the bigger Buddha ones were so intensely detailed they was fantastic to see and feel. Others had minute Tibetan prayers…all written backwards. He showed me his collection of the tools he used, as you would expect all homemade and of the finest, sharpest, quality. He had just done a new wind-horse block, so he was generous enough to sell me his old one for me to knock out a few prayers at home…my Chinese zodiac is the horse, so it felt befitting. Before leaving their peaceful domain, I got a chance of a close-up look at one of the most sustainable bits of kitchen equipment I have seen in a long while. They boil their tea water in a large kettle placed on free standing ring above a large 4′ open concrete bowl covered with a mosaic of mirrors. The light from the sun is directed on to the bottom of the kettle and the kettle is always ready to top up the endless tea pot! 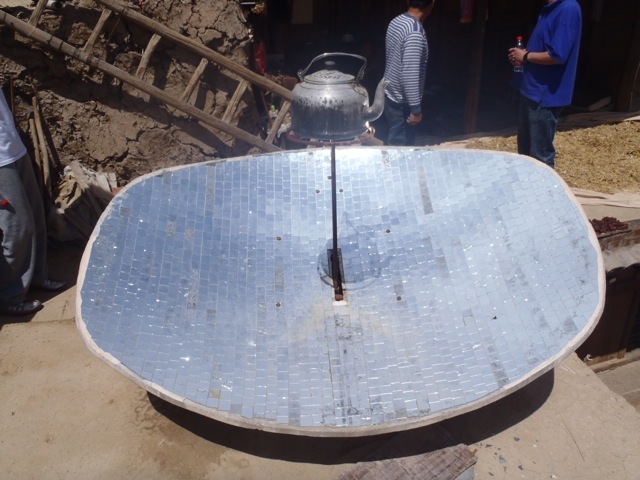 This is a common household device in these parts, and a very clever use of the freest resource around …sunshine! What a wonderful valley! Tongren certainly needs more time, even considering the nightmarish workings of the Chinese state on the Tibetan people and landscape, there is still an overpowering sense of harmony in this existence…when compared to so many other places on the planet. I need to come back to these parts to learn more of the ancient arts and absorb more of the Buddhist philosophy.